Introduction: Today as we continue our journey through the parables of Jesus, I just want to remind you of an important principle when interpreting parables, which is that we should not over-interpret them. It is tempting for many scholars and pastors to start reading all kinds of allegorical meanings into parables such as the one before us today, but I am going to try to resist that temptation and highlight only those features of the parable that can clearly be seen to have meaning in the context in which the parable is given. I am going to try to stress only those aspects of the parable that Jesus Himself seems to stress in the way that He relates the parable in the context. Thus, for example, we will not be getting into fanciful interpretations of what the numbers ten or five might mean with respect to the virgins, or talk about whether or not the oil stands for something. Jesus did not clearly attach any important meaning to such details, and neither shall we. So, without further ado, let's make our way through this parable verse by verse. NKJ Matthew 25:1 Then the kingdom of heaven shall be likened to ten virgins who took their lamps and went out to meet the bridegroom. NKJ Hosea 2:19-20 I will betroth you to Me forever; yes, I will betroth you to Me in righteousness and justice, in lovingkindness and mercy; 20 I will betroth you to Me in faithfulness, and you shall know the LORD. NKJ 2 Corinthians 11:2 For I am jealous for you with godly jealousy. For I have betrothed you to one husband, that I may present you as a chaste virgin to Christ. Of course, in the passage before us today, Jesus is also making use of the additional imagery of the maids who await the coming of the bridegroom and of the following celebration. In the context of this passage, Jesus is using imagery that reflects these practices in order to refer to His second coming. Thus the ten virgins represent those who await His return at the end of the age, at which time the celebration will begin. NKJ Matthew 25:2-4 Now five of them were wise, and five were foolish. 3 Those who were foolish took their lamps and took no oil with them, 4 but the wise took oil in their vessels with their lamps. Notice here that the important point is not how many virgins there were – ten – or how many of the virgins were wise as opposed to how many were foolish – five each – but rather simply that some were wise and some were foolish. And the difference between the wise and foolish virgins is seen in how prepared they were for the coming of the bridegroom. 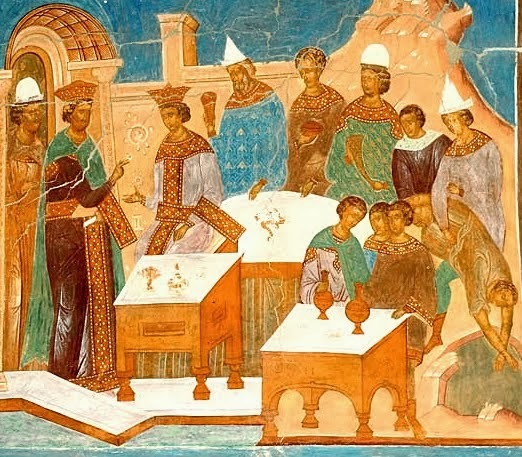 Those who were wise cared about the role they had been given, which was to be ready to shine their lights when the bridegroom arrived, so they made sure not only that they brought their lamps but also that they brought oil to put in them. Those who were foolish, however, really didn't care enough to be ready, so they brought their lamps but didn't bring any oil to put in them. Now, it would seem that all of them claimed to care about the wedding and the coming of the bridegroom. Otherwise why were they there in the first place? And why did they bother to bring their lamps? But as we shall see further on, not all who claim to be friends of the bridegroom truly are. NKJ Matthew 25:5 But while the bridegroom was delayed, they all slumbered and slept. There are two points in this verse of which we should take special notice. Yet Peter was simply repeating the lessons he learned from Jesus, who has prepared us for this delay, and He warns us in this parable to be ready for His return throughout the period of delay. I agree that the issue isn't whether or not they slept when they were tired. The issue is whether or not they were ready and whether or not they were ready at all times, even when they were awakened by the coming of the bridegroom. This becomes clear as we look at the rest of the parable. The wise virgins should not be seen here as being selfish, but rather as being just what Jesus has called them – wise. And this can be seen in the fact they they are prepared to shine their lights. The reason that they will not share with the foolish virgins is that they cannot share with them. For they are supposed to be prepared for the bridegroom, and if they allow the foolish virgins to create the same problem for them that they themselves are facing, then no one will be ready for the bridegroom. In other words, the wise virgins are not driven by selfish interests but by the interests of the bridegroom. And they are not going to take part in the foolishness of those who are unconcerned about the bridegroom and who are thus not ready to meet him as they should be. This teaches us that each one of us is individually accountable to be ready for Jesus' return. And as much as we might like to make others ready, we cannot. Each one is responsible to be ready for himself or herself. This accountability is also quite clearly emphasized by our Lord Jesus in what He says next, for He goes on to describe what happens to both the wise and the foolish virgins. 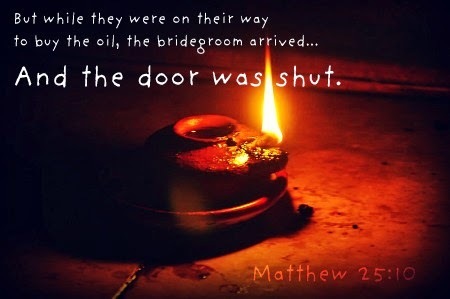 NKJ Matthew 25:10 And while they went to buy, the bridegroom came, and those who were ready went in with him to the wedding; and the door was shut. George Morrison, one of Scotland's most popular preachers in the early 20th century, was known for a sermon titled, “The Ever-Open Door.” And on his deathbed he exclaimed, “It's open for me now, and I'm going through.” As a believer, he surely did go through the door into glory. That door won't always be open, however. Someday the door of grace will close and unbelievers will be shut out of God's presence forever. That is a point I hope we will all consider seriously as we think about this parable, for the Lord Jesus is telling the parable to warn us even now that, although His second coming is delayed, we never know when it will happen, or when our time will run out while we are waiting for it. This is why Jesus is so loving as He continues to warn us and goes on to tell us of the plight of the foolish ones. This verse reflects a previous, similar teaching of Jesus, which is found in the Sermon on the Mount. And it is one of the most frightening passages in Scripture! The point of both of these passages is that many may claim to know the bridegroom – the Lord Jesus Christ – but that doesn't mean that they truly know Him. And the difference between those who truly know Him and those who don't in this parable is seen in their readiness for His coming. There will be many professing believers who will be surprised in that day! I agree that it will indeed be a wonder that any of us will be there, but I don't think we need to worry about whether or not we will be there so long as we are trusting in Christ and looking for His return. To be sure, He does give us this parable as a warning, but it is also an encouragement for those of us who really do trust in Him. For we will also take seriously the primary lesson of this parable, as Jesus goes on to state it. NKJ Matthew 25:13 Watch [γρηγορέω, grēgoreúō] therefore, for you know neither the day nor the hour in which the Son of Man is coming. Once again Jesus stresses what He had earlier told the disciples, namely that no one knows the day or the hour of His return (recall Matt. 24:36). And here is an important reason to “watch” for His return. The word translated watch here is grēgoreúō, which means “literally watch, be or keep awake (MK 13.34)” and “figuratively be watchful, vigilant, alert (MT 24.42)” (Friberg #5683, BibleWorks). Thus, Jesus is saying that His true disciples will live their lives as those who are prepared for His return, always vigilant, always alert, always seeking to do what He has called us to do as we wait. And this includes most especially seeking to fulfill the Great Commission by taking the Gospel to a lost and dying world. As Richard Bauckham has written, “The delay of the parousia [the second coming] is filled with the mission of the church” (as cited by Klyne Snodgrass, Stories With Intent: A Comprehensive Guide to the Parables of Jesus, p. 518). NKJ Matthew 5:14-16 You are the light of the world. A city that is set on a hill cannot be hidden. 15 Nor do they light a lamp and put it under a basket, but on a lampstand, and it gives light to all who are in the house. 16 Let your light so shine before men, that they may see your good works and glorify your Father in heaven. This is the way we must live so as to be ready for His return! And if we are living this way, we shall look forward to his return with joy! Let us, therefore, trust in His enabling grace to make us faithful servants as we look for His coming. Let us pray that He will make us those who may say with faith and joy, “Amen. Even so, come, Lord Jesus!” (Rev 22:20). Jesus tells this parable in the context of His prophecies about His future return and the signs that will precede it. An important emphasis of this teaching is on the fact that we do not know when He will return. Indeed, He tells His disciples that this is one fact of which they can be sure, when He says in verse 36, “But of that day and hour no one knows, not even the angels of heaven, but My Father only.” Thus, this parable deals with the time between Jesus' ascension and return, a period in which His disciples will live with uncertainty as to the time of His return. The master in the parable, then, represents Jesus, and the servants represent those awaiting His return. A teacher tells her young students, “Class, I'm going down the hall to the school office for a few minutes. I don't expect to be away long. I'm sure there won't be any trouble. I'm trusting you to work on your assignments while I'm gone.” Fifteen minutes pass, then 20, then 40. Suddenly the teacher returns. Dennis has just thrown an eraser at Carol, who is doing her math. Steven is standing on the teacher's desk making faces. The students carrying out the teacher's instructions are delighted at the teacher's return, but Dennis and Steven wish she hadn't come back at all. Jesus is coming back! That stands as both a warning and a promise throughout the New Testament, as in today's reading …. It's good news or bad, depending on who hears it. Well, that is exactly what the parable before us today is all about – whether or not we will be ready for Jesus' return. It tells us about a good servant who is ready and an evil servant who is not ready. So let's take a look at 1) lessons to be learned from the good servant, and 2) lessons to be learned from the evil servant. First, his faithfulness is seen in his wisely trusting that the master will return. We are told in verse 45 that he is a “wise servant,” and as such he knows to trust that the master will return. Why else would he take his responsibilities so seriously? Notice also the contrast later drawn between this servant and the evil servant, who apparently has some doubt about the master's return when he says, “My master is delaying his coming” (vs. 48). But watching for Jesus' return entails a life of obedience to Him, which leads to the next way in which the servant's faithfulness is demonstrated. NKJ Matthew 5:10-12 Blessed are those who are persecuted for righteousness' sake, For theirs is the kingdom of heaven. 11 Blessed are you when they revile and persecute you, and say all kinds of evil against you falsely for My sake. 12 Rejoice and be exceedingly glad, for great is your reward in heaven, for so they persecuted the prophets who were before you. First, his faithlessness is seen in his lack of trust that the master will return. Notice in verse 48 that the evil servant “says in his heart, 'My master is delaying his coming. '” And in verse 50 we see that he is “not looking for” his master's return at all! Second, his faithlessness is seen is his lack of commitment to the task his master has given him. Not only does he not properly look after those entrusted to his care, he mistreats them terribly! In verse 49 we are told that he “begins to beat his fellow servants, and to eat and drink with the drunkards.” This description depicts a life of carelessness about the master's priorities, which most notably concerns the care of one's fellow servants. He is like the person who claims to love the Lord, but who does not love his brother. As the Apostle John warns us, “If someone says, 'I love God,' and hates his brother, he is a liar; for he who does not love his brother whom he has seen, how can he love God whom he has not seen?” (1 John 4:20). Now, remember that the good servant didn't know when the master would return either, but he was ready when the master came because he was ready all the time. In contrast, this evil servant is never ready! Jesus never told His followers how to calculate the day of His return. Rather, He emphasized that our main priority is to make sure we're ready for Him, and that we are occupied in His service when He comes (vv.45-46). Are you ready for the arrival of God's Son? Will you be glad to see Jesus when He returns? If not, get ready now. Without delay, turn away from your sin and trust Jesus Christ as your Lord and Savior. Then keep ready by walking in His will every day. Notice that the second invitation gives details about the greatness and the readiness of the feast in order to further entice the guests to come. So, even if they do not care about the king's son, they might perhaps at least want to enjoy such a great feast that has been prepared for them. But this was not the case, as the following verses show. Notice that the second refusal also gives details as to some of the reasons the guests refused to come. They were more concerned about their own lives and business than they were about honoring their king. Their own selfish concerns left them apathetic about the king's concerns. I think this reference to the destruction of their city pertains to Jerusalem, which itself represents the people of Israel as a whole. Not only does the language recall the earlier destruction of Jerusalem at the hands of the Babylonians due to the peoples' rejection of God's messengers, but it also hints at the coming destruction of the city in A.D. 70 for the same kind of rebelliousness. Application: What a good reminder to us that the kingdom of God is for everyone. And we are told to share the invitation to the kingdom with everyone, whether they are society's accepted ones or those regarded as the rejects of society. All are invited, and all that accept the invitation may come. Indeed what is needed is to be properly clothed is a righteousness that exceeds that of the scribes and Pharisees, and this is the righteousness of Christ. Remember Jesus' earlier warning that, “unless your righteousness exceeds the righteousness of the scribes and Pharisees, you will by no means enter the kingdom of heaven” (Matt. 5:20). Conclusion: I will conclude by asking all here today, Have you accepted the invitation to participation in God's kingdom? Have you seen that you have been given a great honor in that you have been extended an invitation to joyful fellowship with Him? If so, then you will also have accepted His terms and rejected your own self-interest and self-righteousness. And you will have accepted the righteousness of Christ as a free gift. If so, then join me in praise and thanksgiving. If not, then I hope you will recognize that today the invitation has been once again offered to you, and it is not too late to accept it. Trust in Christ as the one who died for sinners, rose from the dead, and is seated at the right hand of God to reign over all things. Introduction: Sometimes Jesus' teaching brings together several Scriptural themes in one place, kind of like a busy intersection on the prophetic highway. And this is the case with the teaching before us today. So, given that we will be having a bit of a “Sword drill” for this teaching, we won't waste any time getting right into the text. We will examine this parable under three headings: 1) Jesus' communication of the parable to the Jewish leaders, 2) Jesus' questioning of the Jewish leaders in light of the parable, and 3) the reaction of the Jewish leaders to the parable. We see Jesus' communication of the parable in verses 33-39. There is a significant difference between Jesus' parable and the Isaiah passage to which He clearly alludes. 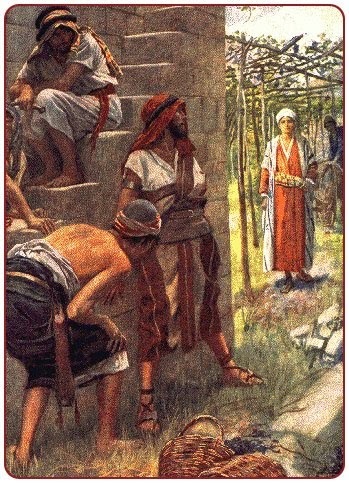 Whereas Isaiah pictures God seeking fruit in the vineyard, Jesus will focus His parable on the workers in the vineyard. This fits well with the fact that Jesus is addressing the religious leaders of Israel. At any rate, the allusion to the passage in Isaiah 5 provides a signal to the hearers that Jesus is talking about the relationship of God to His people, Israel, here represented by their religious leaders. NKJ Jeremiah 19:14-20:2 Then Jeremiah came from Tophet, where the LORD had sent him to prophesy; and he stood in the court of the Lord's house and said to all the people, 15 “Thus says the LORD of hosts, the God of Israel: 'Behold, I will bring on this city and on all her towns all the doom that I have pronounced against it, because they have stiffened their necks that they might not hear My words. '” 20:1 Now Pashhur the son of Immer, the priest who was also chief governor in the house of the LORD, heard that Jeremiah prophesied these things. 2 Then Pashhur struck Jeremiah the prophet, and put him in the stocks that were in the high gate of Benjamin, which was by the house of the LORD. But, just so they won't miss the fact that such a response to the Son deserves to be judged and severely punished, He goes on to get them to admit this, and this leads to our second point. We find Jesus' questions to the Jewish leaders in verses 40-44. In these verses, rather than give a brief explanation of the parable – as we have seen Him do on other occasions – here Jesus drives home the point by asking a couple of questions, which I have paraphrased for us. The Jewish leaders answer Jesus' question in the only way they can, with a clear admission that people who act as those wicked vinedressers acted deserve to be miserably destroyed and to have the vineyard taken away from them and given to others who will produce the fruit required of them. This leads to Jesus' second question. There are several things to notice in Jesus' rhetorical question and and the answer that He Himself gives to it. Thus Jesus indicates with either a direct quote or a clear allusion to three different Old Testament prophecies that what is happening is all a part of God's plan, a plan that cannot be stopped by the Jewish authorities who refuse to accept it. In fact, the plan even takes into consideration their rejection of Jesus! And it also foretells their judgment because of this! What a marvelous reminder that God is always in control, even at those times when we may not fully understand what He is doing, which, let's face it, is most of the time! If this doesn't lead us to worship and thanksgiving for the grace that has been shown to us, then I don't know what will! After all, the only real difference between those of us who know Christ and the Jewish leaders who rejected Him is that God has been gracious to us. We have been chosen by God, as Peter reminds us. And this is what has made all the difference. Now, Matthew doesn't say precisely what this entailed, but we can assume that it wasn't there intention to give Jesus an encouraging pat on the back! No, they were intending some kind of harm, and we can have no doubt that their intention was to kill Him, just as He had said. The only thing that kept them from following through with their plans was the fact that so many of the crowd thought Jesus really was at the very least a prophet. Conclusion: I would like to close today's teaching with a summary of a few of the lessons we should take away from this passage.